0 Comments Posted by Vet Network in General, Industry Trends, Technology, Veterinary Marketing, Veterinary Medicine on Wednesday, August 16th, 2017. 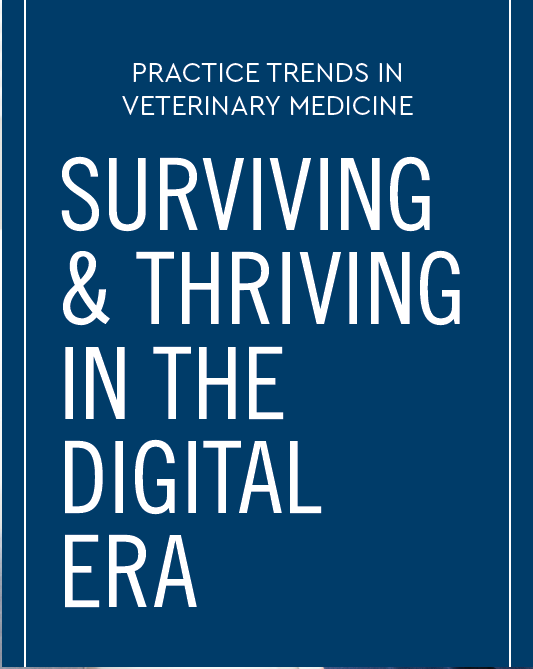 In today’s digital marketplace, pet owners are increasingly turning to online searches and social media to find the veterinary care they desire. In a survey conducted to ascertain the vitality and direction of today’s veterinary practices, most small animal vets said they are hungry to grow their practices and add more new patients but only a small percentage are investing in the marketing required to achieve those dreams. Failure to acknowledge the change in the way potential clients are finding and selecting veterinary services will likely result in lost opportunities. Surviving and thriving in the digital marketplace requires a mindset that embraces change and a willingness to take the steps required to bring such change to fruition. Cleveland, OH veterinarian Gretchen Kocher always had a passion for helping animals, even while working as an accountant. It wasn’t until age 40 that she decided, once and for all, that going to vet school was the only logical path to fulfilling her dream. Dr. Kocher knew the next 4 years would be challenging, but she also understood that those 4 years would pass regardless of her decision; at age 44 she could either be stagnating behind a desk or, as she is today, pursuing her passion as a mobile vet specializing in senior and end-of-life care. While few would argue that the prospect of change can be intimidating, an unwillingness to explore the potential upside of such change can easily become a self-fulfilling prophecy of inertia and, ultimately, lost opportunity. Had Dr. Kocher chosen to settle for the status quo, a rewarding career would never have come to fruition, and her patients and their owners would have missed out on years of skillful, compassionate care. What are you Missing—and Who is Missing You? Resistance to change can impact far more than the choice of a career path. For veterinarians, such resistance also can create a potentially insurmountable barrier between practice goals and the steps required to achieve them. In a 2017 national online survey conducted by Champlain Data, LLC, two-thirds (63%) of 370 small animal veterinarians reported an increase in the number of patient visits in 2017 versus 2016, suggesting an upward trend over the past year. In fact, more than half (55%) of those surveyed felt sufficiently comfortable to expand or remodel their facilities or to add additional staff or services such as dental care and grooming. That’s the good news—the rest is counterintuitive at best. When the vets were asked about growing their practices, 93% reported that they are, indeed, looking to add new patients. 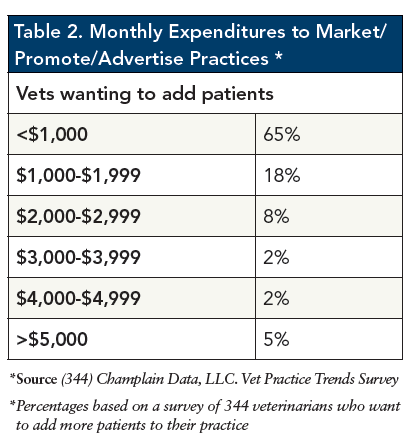 At the top of this practice growth “wish list” were the 63% of these vets who said they’d like to add 15 or more patients per month. But despite these goals more than half (58%) of this group reported spending less than $1,000 per month on marketing and promotion (Table 2). Goals look great on paper, but are worth little more than that paper without the commitment to take the steps to achieve them. Word-of-mouth referrals have long been considered the bread and butter of veterinary practices. Today, however, 93% of online experiences begin with a search engine (https://www.searchenginejournal.com/10-stats-to-justify-seo/36762/), indicating the desire to locate a product or service. With potential clients—especially those 45 years and younger—relying upon digital technology to find almost every imaginable product and service, including veterinary care, practitioners who don’t take full advantage of this new reality are turning a blind eye to untapped opportunity. In today’s digital marketplace, meeting consumers where they “live” requires establishing and nurturing a strong online presence. First things first: consumers expect websites to be well-designed, easily navigated and frequently updated. These qualities are a reflection of the businesses’ professionalism, and potential clients may well move on to the next listing when what they see on your website falls short of their expectations. In the Champlain survey more than one-third (39%) of the reported updating or adding content less than once per month, and 14% of the respondents don’t have websites at all. And because nearly 90% of mobile users are using those devices to search for local information (http://searchengineland.com/research-56-percent-go-searches-carry-local-intent-190655), having a website that isn’t mobile-friendly is like turning a blind eye to a myriad of potential clients. Also consider that while you’re treating an infection or performing surgery your prospective clients are most likely “tweeting,” “friending” and “liking,” and your current clients may well be “yelping.” If these terms are foreign to you, you have only to ask any staffer to translate the lingo and show you the ropes of social media—a virtual “referral search engine” where businesses connect with consumers while promoting products and services, and where pet owners post and blog about their vets. Make no mistake: those posts and blogs include reviews, both positive and negative, of you, your staff and the care you provide, and they remain in the virtual world in perpetuity—for all to see. Operating without a strong social media presence is like trying to communicate postop instructions with smoke signals, and failing to acknowledge client feedback is tantamount to performing surgery blindfolded. For vets not already whole heartedly embracing social media, the time has come to stop burying their heads in the proverbial sand . While there’s little doubt that your future clients are going online to search for vet care, whether or not they actually find you depends, in large part, on your ranking in the search engines they use. Ninety-four percent of all Google searches begin and end on page 1 and ~75% of those searching will miss your practice if it’s not one of the top 3 listings (https://blog.seoprofiler.com/update-clicks-results-googles-results-page/). But despite this unflinching reality many vets seem to be operating in the dark. In the Champlain Data survey only 37% of the vets whose practices have websites said they knew where their facilities ranked in local Google searches. Of those practices only 44% had checked their rankings in the week prior to the survey, and less than half (45%) reported paying for search engine optimization services to improve website visibility. Businesses that operate without awareness of their rankings are, in essence, running blind. And practices that don’t ensure their visibility via first-page listings are essentially invisible to potential clients searching online. When clients lose beloved pets and, as they sometimes do, say they’ll never have another animal because the loss is simply too much to bear, you might well tell them that making such a decision at a time of grief would amount to a self-fulfilling prophecy that will deny them what they want most; namely, years of loving companionship. For vets seeking not only to ensure the success of their practices but also to thrive in the years to come, this type of self-fulfilling prophecy comes in the form of resistance to doing what’s needed to achieve their practice goals. After all, a desire to grow your practice is nothing more than a dream if you fail to take the steps needed to bring that desire to fruition. The undeniable truth is that today’s digital marketplace requires a more aggressive approach to marketing and promotion than ever before. A commitment to such an approach is, at the very least, as much an investment in your practice as is additional staff or new equipment, and 1 more day of failing to act will bring you only 1 less day of the chance to fully realize your practice’s potential.